On his record breaking night, Jerrod Heard put up a record breaking 527 yards of total offense (Photo: Don Bender). The point-after kick in college football — a kick taken from the 10-yard line and amounting to a 20-yard field goal — is the most basic of plays. 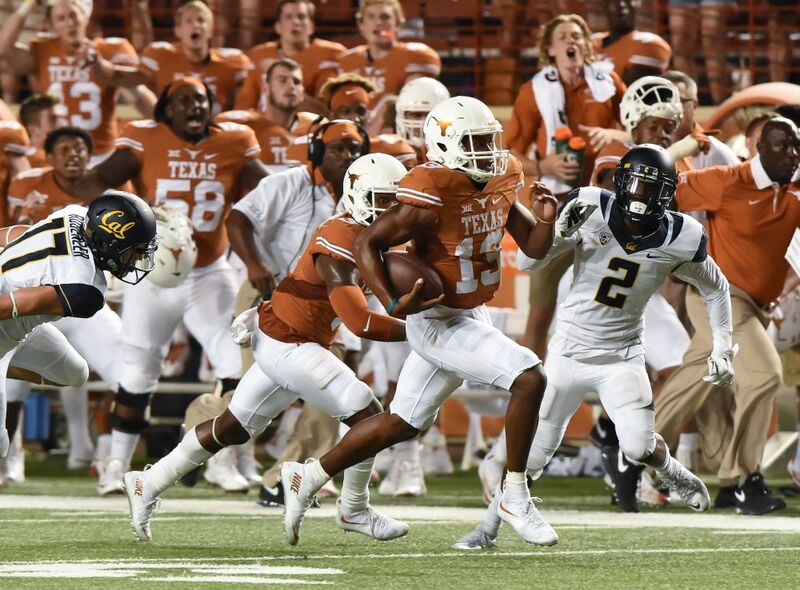 So when Texas’ Nick Rose lined up to perform the kick that would punctuate a final touchdown run by Jerrod Heard to tie the game against California, coach Charlie Strong didn’t even bother to watch. With only 1:11 left to play, Rose saw Cal’s Darius White roar around the end of the line. Rose missed the extra-point kick, kicking the ball wide right and securing Cal’s 45-44 victory before a feverish, and then stunned, crowd of 91,568 fans Sept. 19 at Darrell K Royal-Texas Memorial Stadium.